Out of the Money Call - What Does It Mean? 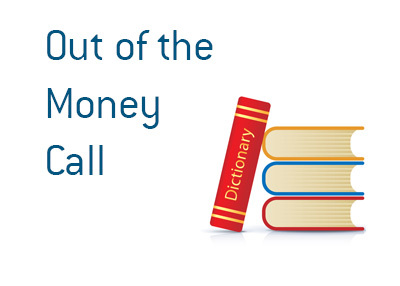 What does the term "out of the money call" mean in the world of finance? What is meant by an out of the money call? An "out of the money" call is a call option in which the underlying stock hasn't yet reached the strike price. For instance - let's say that MSFT is trading at $55. Let's take a $60 MSFT call that is expiring in a month. This call is said to be "out of the money", as the underlying stock is trading at $55. This call has no intrinsic value - instead, it's value is derived from implied volatility and time value. If MSFT was trading at $65, this same call would be "in the money". In this case, the call would have $5 in intrinsic value, plus implied volatility and time value. By purchasing an out of the money call, investors can leverage their thesis that a stock is going to rise without risking too much of their capital. By selling an out of the money call, investors who own the underlying stock can generate income. This is called a "covered call".